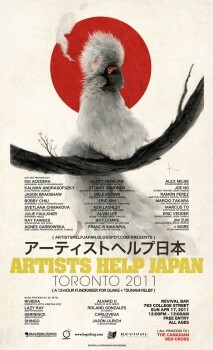 Hey everyone, this is an event I’m helping to organize here in Toronto on April 17th. I would love it if you could attend, and help us spread the word! – Dozens more cartoonists will donate original art, books, and other rare items to be featured in a silent-auction on-site at Revival Bar. – $1 from the sale of every drink at Revival Bar will be donated to the Canadian Red Cross. Previous PostJapanese Film Screening for Tsunami Relief April 5thNext PostDance! Dance! TO! Hi Chris, I’m Karen from the Canadian Red Cross. Just dropping you a line to thank you for your support to Japan.